Yeay, another liquid nitrogen ice cream concept in town! This time, launched on September 2013, Elixcir Artisan Gelato first made its appearance to public during AFA (Anime Festival Asia) at JCC Senayan on September 7th, 2013 with a pop-up store which successfully tamed huge crowd. Too bad I couldn’t come that day, but it must have been such a crowd pleaser. As this post is written, they still don’t have a permanent store yet so right now you can only enjoy them via pop-up stores. And while waiting for them to open their very own brick and mortar shop (Pssstt… a bit of sneak peek includes freshly brewed coffee, PotionBlend and nibbles! ), Elicxir team has made it possible to cater to private events such as weddings, birthday parties, corporate events and other events as requested (see full details at the end of post). That made me feel honored to sample their treats at the previous “BLOG PARTY” event, hosted by our dear friend Ruby at Comma co-working space, 17 September 2013 (a month ago, I know... #LateReport). Learning SEO tips and tricks while enjoying potluck meals and FREE gelato by Elicxir? YES, please! Elicxir Artisan Gelato was created by two passionate friends out of their love for desserts, Jenifer Patricia (met her from Gastro Alley tasting!) and Jansen. 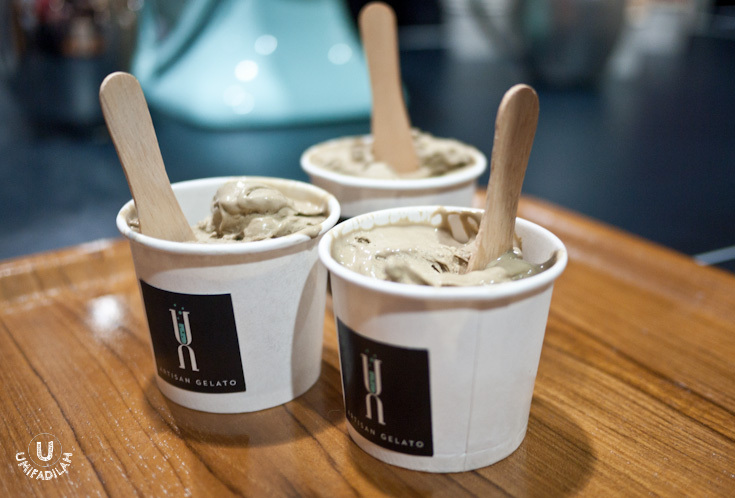 The name Elicxir itself revolves around Alchemist theme – they said in their future store customers would be able to create their own “Potion Gelato” with the use of various ingredients selection. Mix the base, fruits, syrups, or anything else you like and BAM! Your very own personal elixir is created out of the cool nitrogen mist. Love the philosophy – the brand’s quite easy to pronounce but tricky to spell, haha. Other interesting thing about Elicxir is their unique ﬂavors. That includes Avocado Mocha, Mooncake, White Chocolate, Cardamom, Chocolate Matcha, Vanilla Beetroot, Tokyo Banana and many other seasonal ﬂavors that can be custom-made. Can’t wait for them to open up a real store! Meanwhile here’s few shots I got from the BLOG PARTY event. Chocolate Macha. Light chocolate flavor with hints of green tea flavor. The texture is very smooth, and one thing I like the most: it has the perfect amount of sweetness. Yum! 1. MAGIC Elicxir Package 100 pax (Rp 4,249,000*) – 2 ice cream flavors, 2 toppings. 2. MANA Elicxir Package 250 pax (Rp 9,990,000*) – 4 ice cream flavors, 4 toppings. Any custom inquiries just let 'em know via email: ElicxirGelato@gmail.com and ask for Jenifer/Jansen respectively. Can't wait for the permanent store! *all of the information above are taken from Elicxir Press Release material.